This article was first published on the website of the British Academy. We share again with author's approval. The Living Amid the Ruins project conducted ethnographic fieldwork with local communities living by the archaeological sites that are part of the Pisidia Heritage Trail, touching upon many aspects of rural life in Southwest Turkey. The project was completed in March 2018. 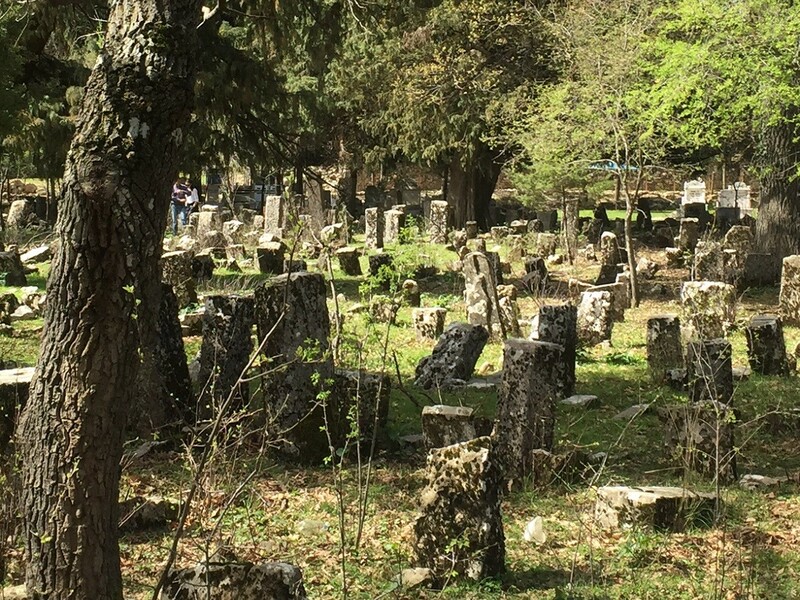 In this blog, Dr Güldem Baykal Büyüksaraç explores Selge (antique name) / Altınkaya (present name), a remarkable example of what ‘living amid the ruins’ means. Its residents have found ways of surviving in a shrinking village, coping with the limitations of living in a conservation zone and a national park as well as the inescapable effects of neoliberal rural policies. It was only after I heard about it in an interview that I realised it was there. A wrecked red truck, abandoned in the cemetery of the village, rusting away on the edge of life, not holding out much hope. But when I saw it in the cemetery, I thought, this is where this old truck is meant to be now, for it too belonged to everyone and to no one. The truck serves as a relic of a stillborn village development cooperative, founded under the leadership of one good man who died prematurely. In the late 70’s and earlier, people from Altınkaya would take their wheat to the mills in nearby villages, which the elderly remember as a lengthy and arduous trip that took two to three days. It was that good man – Mr. Aziz Rahman Sert, the son of an imam from the Oluk quarter – who decided to end this rezillik (misery). Aziz was an intelligent, well-educated person, who returned home to help out his people. He would lead his fellow villagers in applying for state funding, to purchase a motor for the mill to be built by angarya, the free labour of the local men. He had yet bigger plans for Altınkaya, establishing a village development cooperative and, with the remittances collected from the members, buying a vehicle to carry people, goods, and logs from the forest. That is how the villagers acquired the second-hand Ford truck, now resting in the cemetery. The cooperative soon hired a driver, who with this truck would work for years as a çavuş (overseer), organising casual labourers (mostly women) in groups for relic the cotton fields and, later on, for laundrettes around Antalya. The Altınkaya community is structured by a simple kinship-based division of labour and subsistence economy. Agricultural production is very limited due to small land holdings, insufficient soil quality and traditional methods of farming. Unsurprisingly, the cooperative functioned only in limited, non-agricultural ways, such as providing transportation and organising the local istihsal (procurement) of forest products, including timber transportation. And yet, as the community could no longer hold procurement rights due to increasingly stringent conservation rules, a major task of the cooperative would soon become irrelevant. The Altınkaya Cooperative is a failed project of development. It did not last long largely because the villagers lacked the know-how about managing a cooperative. I remember an ex-member telling me that “it depends on the accountant whether or not a cooperative will make money and survive.” Several years after its establishment, in 1984, the post-coup d’état government abolished the Central Union of Cooperatives, KÖY-KOOP. Many had viewed the union as a potentially strong and autonomous grassroots movement, and its abolishment implied that cooperativism would be shelved in Turkey until the state put it back on the “right” track. In the meantime, many rural initiatives, including the Altınkaya cooperative, disintegrated. 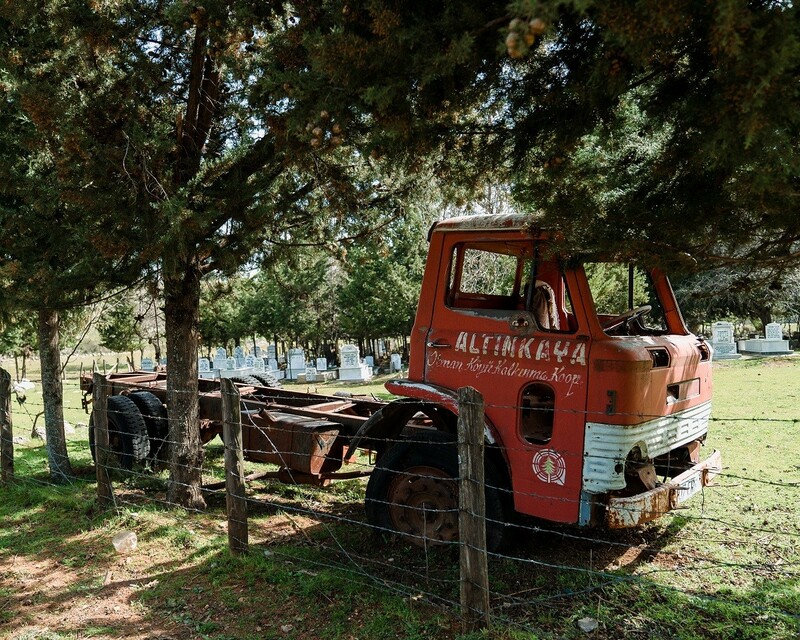 In one sense, the rusty truck wreck is a relic of a cooperative that is fading into oblivion, a survival from Altınkaya’s economic history prior to neoliberalism. A perspective from inside the cemetery, however, captures a more nuanced significance about this truck’s existence and location. Here is a space that defies the distinction between the modern and the pre-modern, between the living and the non-living. The people of Altınkaya, have found ways to shape and reshape the civilisation they live in, collecting bits and pieces from a distant past to creatively incorporate them into their cultural repertoire. They have given a new life to these artefacts and turned them into their own heritage. With the remnants of a Hellenistic or Roman temple, they sometimes built a cemetery, sometimes a house. I imagine the wrecked truck, standing next to all these elements from the present and past history, as part of a “memorial” landscape that serves to commemorate earlier generations and the ways in which they sought to cope with their poverty and geographic isolation. Perhaps it has a worthy purpose in its existence in a sacred space rather than in a wreck yard somewhere far away, as a reminder of the possibility of cooperation and collectivism in economic life and to cultivate hope for staying in Altınkaya among those who dream about moving to a town for a more stable income. The continued and emergent subsistence practices of the community make me think that this is not a false hope. Each time I visit the place, I feel like it has a rhyme and rhythm of its own, with its men and women always busy with something: planting-tilling-harvesting, herding and breeding, dairy production, beekeeping, spoon carving, street vending, selling non-timber forest products, rafting tourism, hiking tour guidance etcetera. These people hold on with obstinacy to stay in Altınkaya, despite poor life conditions and hardships due to unemployment and strict conservation policies. In the ‘Living Among the Ruins’ project, I try to envision new means of subsistence for Altınkaya and other settlements in Pisidia. I discuss with villagers about farmers’ cooperatives, handicraft collectives, community-based tourism and so on. There is a lot to learn from earlier attempts of development, be they state projects or local initiatives. After all, a wrecked truck as a metonym for a failed enterprise could be more telling than a ‘success story’. * Dr Güldem Baykal Büyüksaraç worked on the British Institute at Ankara's ‘Living Amid the Ruins: Archaeological Sites as Hubs of Sustainable Development for Local Communities in Southwest Turkey’, funded under the British Academy Global Challenges Research Fund. She is affiliated with Istanbul University. The project is part of the British Academy’s Sustainable Development Programme which supports excellent, policy-oriented research, aimed at addressing the UN’s 2030 Agenda for Sustainable Development and advancing the UK’s Aid Strategy. So far, the programme has funded 16 UK research teams exploring questions related to sustainable governance, sustainable growth and sustainable human development. * Cover photo: Koray Kalay and Ekin Kazan.